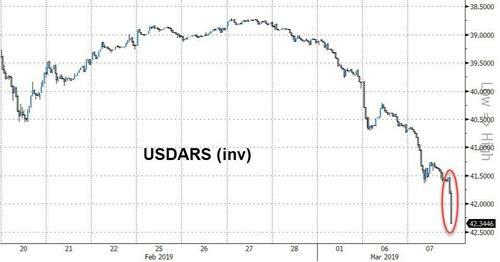 With inflation soaring (and forecast to accelerate further), the Argentine Peso has plummeted the last few days even as the central bank raised 7-day Leliq rate to 51.862%, according to two people with direct knowledge. Peso has dropped 11% this year, making it the worst performer against USD. As Bloomberg notes, Argentina’s famous grass-fed beef likely emerged as a top inflation driver in February, analysts at JPMorgan wrote in a note on Wednesday. The bank raised its consumer price forecast for that month to 3.9 percent from 3.2 percent. 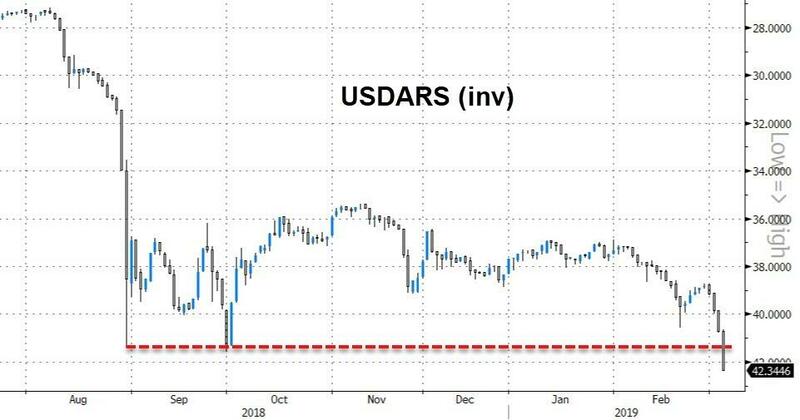 "The main culprit," JPMorgan analysts Lucila Barbeito and Diego Pereira wrote "is red meat, with prices that surprised to the upside in the past month." Specifically, economists polled by Argentina’s central bank increased their end-2019 inflation expectations to 31.9% from 29%, according to the institution’s February survey.